Last year in December, SAA nominated and sent coach Tan Wei Leong to the USATF/IAAF Academy for Sprints & Hurdles Course, which was held at IMG Academy – Bradenton, Florida. Below is his write-up on his continuing coaching education experience. 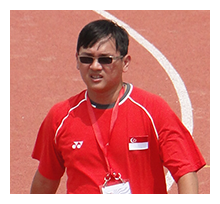 Republic Polytechnic facilitator Tan Wei Leong successfully completed for the first part of the 2013 International Association of Athletics Federations (IAAF) Academy Diploma (Sprints and Hurdles) course, held in Bradenton, Florida, USA on 4-18 December, 2013. The submission of a report for an 8-month unsupervised practicum in Singapore will complete the course in 2014. What makes this particular course special is that it will be conducted by the preeminent names in track and field, including legendary coaches Loren Seagrave, John Smith and Gunter Lange. Thanks to the endorsement and support of the Singapore Athletic Association (SAA), I was able to meet and learn directly from sprint coach gurus in the US. The course followed a gruelling 11-hour a day schedule covering both theory and practical sessions over seven days. Attendees’ performances were evaluated on the basis of four assessments: a pre-course written assignment, a poster presentation of each coach’s working environment (I presented “Singapore Athletics – The Current State of Play” in the form of a board game), a practical coaching component, and a final presentation of each coach’s proposed unsupervised practicum to be carried out over the following eight months. For this first part of the course, I was blessed with a score a total of 44/45 marks. The remaining 55 marks will be awarded based on the merits of the final submission comprising a full reflection journal and case study report for the unsupervised practicum. For this component, I will report on the application of cutting edge analytics and an interdisciplinary approach to the coaching of Singapore top sprinters. On the future of Singapore athletics, I truly believe that Singapore can excel in track and field in the next few decades if all the hearts and minds involved – coaches, teachers, scientists, parents, fans and the athletes themselves – are aligned and fully dedicated to training and studies. All parties must play their part in putting our athletes on the winners’ podium.